The Octagonal Gazebo is the perfect venue for your summer event, be it afternoon tea, a garden party, or a full blown wedding. 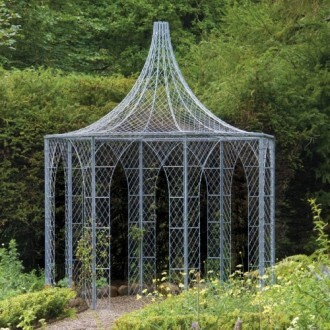 Gazebos and arches in the garden are beautiful additions to any garden at this time of year, especially when festooned with roses and clematis. The Octagonal Gazebo can be made with a range of arched, window or full lattice side panels so you can create the perfect gazebo to suit you and your garden, whatever the event.